In the recent past, composite iron shafts were not looked on as something suitable for strong, low handicap, competitive golfers. The idea that composite, aka graphite, iron shafts belonged in the bag of a tour pro is still hard for many traditional minded golf professionals to accept. Then, Brandt Snedeker comes along and wins the 2012 FedEx Cup with composite iron shafts in his bag. Composite has arrived and the composite shaft companies are delivering tour quality shafts. 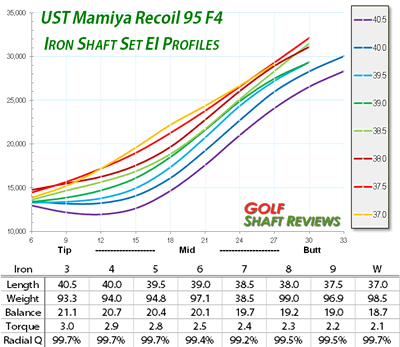 The UST Mamiya Recoil ascending weight iron shaft is one such golf shaft. It released in 2013 through the UST Mamiya TourSPX dealers. I first saw this shaft in its prototype version two years ago. This review is about the ascending weight taper shafts. It does not apply to the parallel shafts available to the general public. I have not yet looked at those shafts. Michael Guerrette, Senior Director of R&D discussed the Recoil with me at the PGA 2013 merchandise show. This entry was posted in Iron Shafts - Composite, Russ Ryden - Fit2Score, UST Mamiya on July 1, 2013 by Russ.